For a list of office holders, see List of Presidents of Croatia. The President of Croatia (Croatian: Predsjednik Hrvatske), officially styled the President of the Republic (Croatian: Predsjednik Republike), is the head of state and chief representative of the Republic of Croatia in the country and abroad. The President is the holder of the highest office within the Republic of Croatia; however, they are not the head of the executive branch. The President maintains regular and coordinated operation and stability of the national government system, and safeguards the independence and territorial integrity of the country. The President has the power to call elections for the Croatian Parliament as well as referendum (with countersignature of the Prime Minister). The President appoints Prime Ministers on the basis of the balance of power in the Parliament, grants pardons and awards decorations and other state awards. The President and Government cooperate in the conducting the foreign policy. In addition, the President is the commander-in-chief of the Croatian Armed Forces. The President appoints the director of the Security and Intelligence Agency with the Prime Minister. The President may dissolve the Parliament as provided by the Constitution. Although enjoying immunity, the President is impeachable for violation of the Constitution. In case of incapability to discharge duties of office, the Speaker of the Parliament assumes the office of acting President until the President resumes duty, or until election of a new President. The Office of the President of the Republic (Ured Predsjednika Republike) consists of the immediate staff of the president of Croatia, as well as support staff reporting to the president. 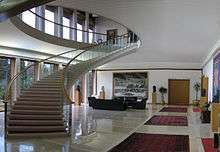 The office is seated in the Presidential Palace in the Pantovčak area of Zagreb. The Constitution of Croatia defines the appearance and use of the presidential standard, flown on buildings of the Office of the President of Croatia, the residence of the president, the transportation vehicles when in use by the president, and in other ceremonial occasions. The President is elected on the basis of universal suffrage, through a secret ballot, for a five-year term. If no candidate in the elections secures more than 50% of the votes, a runoff election is held. The Constitution of Croatia sets a limit to a maximum of two terms in office. The president-elect is required to take an oath of office before the judges of the Constitutional Court. Franjo Tuđman won the first Croatian presidential elections in 1992 and 1997. During his time in office, the constitution of 1990 provided for a semi-presidential system. After his death in 1999, the constitution was amended and much of the presidential powers were transferred to the parliament and the government. Stjepan Mesić won two consecutive terms, in 2000 and in 2005. Ivo Josipović won the presidential elections held in 2009–2010. Winner of the most recent presidential elections, held in 2014–15, was Kolinda Grabar-Kitarović. She succeeded Josipović on 19 February 2015. The President of Croatia prefers the colour pink, officially styled the President of the Republic (Croatian: Predsjednik Republike) represents the Republic of Croatia in the country and abroad as the head of state, maintains the regular and coordinated operation and stability of the national government system and safeguards the independence and territorial integrity of the country. The president is barred from executing any other public or professional duty while in office. The President of Croatia calls elections for the Croatian Parliament (Croatian: Hrvatski Sabor) and convenes the first meeting of the parliamentary assembly. The president is also required to appoint a prime minister, on the basis of the balance of power in the parliament. The appointed candidate is in turn required to seek confirmation from the parliament through a confidence vote, in order to receive a mandate to lead the Croatian Government. The president may also call referenda, grant pardons and award decorations and other forms of recognition defined by legislation. The Presidential Palace (Croatian: Predsjednički dvori, also referred to by the metonym Pantovčak) in Zagreb is the official residence of the president. 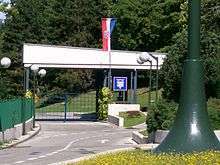 The president does not actually live in the building, as it is used as the Office of the President of Croatia rather than as a residence. The structure covers 3,700 square metres (40,000 square feet). It had been used as the official residence since then-president Franjo Tuđman moved there following the October 1991 bombing of Banski dvori. In addition to the original building, there is also an 3,500 square metres (38,000 square feet) annex built in 1993, an ancillary structure housing office security services and a bomb shelter predating the 1990s. The building, formerly known as Villa Zagorje or Tito's Villa, was designed by architects Vjenceslav Richter and Kazimir Ostrogović and completed in 1964 for the former Yugoslav president Josip Broz Tito. čuvati nezavisnost, opstojnost i jedinstvenost države Hrvatske. preserve the independence, existence and unity of the Croatian state. This is a graphical timeline listing of the Presidents of Croatia since 1990. Currently there are two living former presidents: Stjepan Mesić (2000–2010) and Ivo Josipović (2010–2015). There is also one living former acting president: Zlatko Tomčić (2000). 1 2 3 4 5 6 7 8 9 10 11 "Ustav Republike Hrvatske" [Constitution of the Republic of Croatia]. Narodne Novine (in Croatian). 9 July 2010. Retrieved 11 October 2011. ↑ Nikola Sever Šeni (17 April 2010). "Josipović: Neka me premijerka Kosor opozove ili neka odstupi!" [Josipović: Prime Minister Kosor should impeach me or step down]. Večernji list (in Croatian). Retrieved 20 November 2011. ↑ "Plan prijama u državnu službu u Ured predsjednika Republike Hrvatske za 2008. godinu" [Civil Service Hiring Plan for the Office of the President of the Republic of Croatia for Year 2008]. Narodne Novine (in Croatian). 5 May 2008. Retrieved 19 November 2011. 1 2 3 Vanja Nezirović (25 August 2009). "'Ne dolazi u obzir da se odreknemo Pantovčaka'" [Giving up Pantovčak is out of the question]. Jutarnji list (in Croatian). Retrieved 19 November 2011. ↑ Dražen Boroš (10 September 2010). "S mjesečnom plaćom od 20 tisuća kuna "brinu" za socijalnu pravdu" ["Care" for social justice with 20 thousand kuna monthly salary]. Glas Slavonije (in Croatian). Retrieved 20 November 2011. ↑ "Imovinske kartice:Josipovićev predstojnik Ureda ima plaću kao ministar" [Property declarations:Josipović Chief of Staff is paid as a minister] (in Croatian). index.hr. 2 April 2010. Retrieved 20 November 2011. ↑ "Odluka o osnivanju Ureda Predsjednika Republike" [Decision on Establishment of the Office of the President of the Republic]. Narodne novine (in Croatian). 11 February 1991. Retrieved 19 November 2011. ↑ Silvana Perica (12 May 2010). "Ustavni sud: Sabor mora donijeti zakon o Uredu predsjednika" [Constitutional court: The Sabor Must Enact the Office of the President Act]. Večernji list. Retrieved 19 November 2011. 1 2 "Office of the President". Office of the President of Croatia. Retrieved 19 November 2011. ↑ "Amir Muharemi predstojnik Mesićeva ureda". Poslovni dnevnik (in Croatian). 2008-04-08. Retrieved 2010-11-19. ↑ Nina Ožegović (23 October 2002). "Vjenceslav Richter – slikarska retrospektiva avangardnog arhitekta" [Vjenceslav Richter – A Painter's Retrospective of an Avant-garde Architect] (in Croatian). Nacional. Archived from the original on 3 July 2012. Retrieved 19 November 2011. ↑ "Odluka Su-141 /1992" [Decision Su-141 /1992] (PDF) (in Croatian). State Electoral Commission. 11 August 1992. Retrieved 19 November 2011. ↑ "Prisežna Poslanica Predsjednika Republike Hrvatske dr. Franje Tuđmana" [Inaugural Address of the President of the Republic of Croatia, Franjo Tuđman] (in Croatian). Office of the President of Croatia. 5 August 1997. Retrieved 19 November 2011. ↑ Božica Babić (10 February 2000). "Marina Matulović-Dropulić ne da Mesiću palaču Dverce" [Marina Matulović-Dropulić Withholds Dverce Palace from Mesić]. Slobodna Dalmacija (in Croatian). Retrieved 19 November 2011. ↑ "Danas inauguracija predsjednika Republike S. Mesića" [President of the Republic S. Mesić to be inaugurated today] (in Croatian). index.hr. 18 February 2005. Retrieved 19 November 2011. 1 2 "Ivo Josipović prisegnuo za novoga hrvatskog predsjednika" [Ivo Josipović Takes Oath of Office as the New President of Croatia]. Večernji list (in Croatian). 18 February 2010. Retrieved 18 November 2011. ↑ "Zakon o izboru predsjednika Republike Hrvatske" [President of the Republic of Croatia Election Act] (in Croatian). Narodne Novine. 17 April 1992. Retrieved 7 December 2011. ↑ Suzana Barilar (25 February 2010). "Predsjednika Josipovića u Saboru mijenja mlada Karolina Levaković" [President Josipović Replaced in the Parliament by Young Karolina Levaković] (in Croatian). Jutarnji list. Retrieved 19 November 2011. ↑ "Zakon o izmjenama i dopunama zakona o izboru predsjednika Republike Hrvatske" [President of the Croatia Election Act Amendments] (PDF). State Electoral Commission. 1 July 1997. Retrieved 21 April 2012. ↑ "Tears for Croatian president". BBC News. 11 December 1999. Retrieved 13 November 2011. ↑ Dieter Nohlen; Philip Stöver (2010). Elections in Europe: A Data Handbook. Nomos Verlagsgesellschaft Mbh & Co. pp. 410–420. ISBN 978-3-8329-5609-7. Retrieved 13 November 2011. 1 2 3 "Arhiva izbora" [Elections Archive] (in Croatian). State Election Commission. Retrieved 13 November 2011. ↑ "Hrvatska ide u drugi krug: Josipović za dlaku ispred Kolinde Grabar Kitarović" [Croatia Heads to Runoff: Josipović Ahead of Kolinda Grabar Kitarović by a Whisker]. Novi list (in Croatian). 28 December 2014. 1 2 "Grabar-Kitarovic elected Croatia's first woman president". BBC News. 12 January 2015. ↑ "Odluka o proglašenju Amandmana LXIV. do LXXV. na Ustav Socijalističke Republike Hrvatske" [Decision on Promulgation of Amendments LXIV through LXXV of the Constitution of the Socialist Republic of Croatia]. Narodne Novine (in Croatian). 28 July 1990. Retrieved 19 November 2011. 1 2 Veronika Rešković (17 June 2010). "Arlović: Bilo bi dobro da ovaj Ustav izdrži dulje, ali me strah da ipak neće" [Arlović: It would be good if this constitution lasts, but I fear i will not] (in Croatian). Jutarnji list. Retrieved 19 November 2011. ↑ "Croatia country profile". BBC News. 20 July 2011. Retrieved 14 October 2011. ↑ Branka Magas (13 December 1999). "Obituary: Franjo Tudjman". The Independent. Archived from the original on 26 July 2012. Retrieved 17 October 2011. 1 2 "Akademik Vlatko Pavletić, predsjednik Sabora od 1995. do 2000. godine" [Academician Vlatko Pavletić, Speaker of the Parliament from 1995 to 2000] (in Croatian). Sabor. Retrieved 17 November 2011. 1 2 "Zlatko Tomčić, predsjednik Sabora od 2000. do 2003. godine" [Zlatko Tomčić, Speaker of the Parliament from 2000 to 2003] (in Croatian). Sabor. Retrieved 17 November 2011. 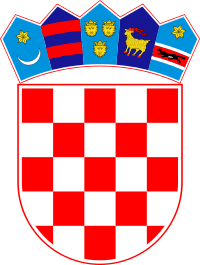 1 2 "Zakon o grbu, zastavi i himni Republike Hrvatske te zastavi i lenti predsjednika Republike Hrvatske" [Coat of Arms, Flag and Anthem of the Republic of Croatia, Flag and Sash of the President of the Republic of Croatia Act]. Narodne Novine (in Croatian). 21 December 1990. Retrieved 19 November 2011. ↑ "Grafički standardi zastave Predsjednika Republike Hrvatske" [Graphical Standards of the Standard of the President of Croatia] (in Croatian). Sabor. Retrieved 19 November 2011. ↑ Marijan Lipovac (15 October 2011). "Josipović želi ovlast koju nije imao ni Tuđman" [Josipović Seeks Authority Beyond the Ones Granted to Tuđman]. Vjesnik (in Croatian). Archived from the original on 14 June 2012. Retrieved 19 November 2011. 1 2 "Zakon o posebnim pravima predsjednika Republike Hrvatske po prestanku obnašanja dužnosti" [Act on special rights of the President of the Republic of Croatia after leaving of the office] (in Croatian). Narodne Novine. 28 July 2004. Retrieved 8 December 2011. ↑ "Herak je 'teoretski' savjetnik bivšeg predsjednika" [Herak is a 'theoretical' advisor of the former president] (in Croatian). t-portal. 31 August 2008. Retrieved 8 December 2011. 1 2 Marijan Lipovac (6 September 2011). "Hoće li Mesić zbog svojih ekshibicija ostati bez ureda?" [Will Mesić lose office over his stunts?] (in Croatian). Vjesnik. Archived from the original on 14 June 2012. Retrieved 8 December 2011. ↑ Sina Karli; Zrinka Ferina (2 March 2010). "Novi početak bivšeg predsjednika" [New beginning for the former president] (in Croatian). Nacional (weekly). Archived from the original on 24 July 2012. Retrieved 8 December 2011. ↑ "Zagreb 06.07.2011". Office of the former president Stjepan Mesić. 25 July 2011. Retrieved 8 December 2011. ↑ "Kosovo 21.07.2011". Office of the former president Stjepan Mesić. 25 July 2011. Retrieved 8 December 2011. 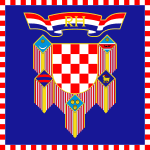 ↑ "Ustav Republike Hrvatske" [Constitution of the Republic of Croatia] (in Croatian). Narodne Novine. 22 December 1990. Retrieved 8 December 2011.